One of the many new things that is being introduced during the Collaborate 2011 and 2011 MySQL Users’ Conference are some great new additions to some of the external tools for managing MySQL servers. One of those tools receiving updates is the MySQL Workbench. There are two ways to access the utilities from within the MySQL Workbench. You can click on the drop down arrow icon to the right of the MySQL Workbench main window. This will display a list of the plugins available. You can scroll through the screens and find the MySQL Utilities icon. The image below shows what the window looks like. Once you hover on the MySQL Utilities icon, you will see an Action button appear. Click Action then Start Plugin to launch the MySQL Utilities shell in a new window. The image below shows what the window would look like. You can launch any of the utilities listed by typing the name of the command. To find out what options are available, use the --help option. Note: you can also add the MySQL Utilities icon to your home screen. Highlight Add to Home Screen and then choose a position from the menu. You can also launch the MySQL Utilities command window by clicking on the Plugins menu item and selecting Start Shell for MySQL Utilities. The MySQL Workbench and MySQL Workbench Utilities developers are adding new features and utilities with every release. If you don’t see a utility you want, check back with each release of Workbench or send the developers an email and let them know what you want! You should try the --help option for each tool to see what options it supports. Some utilities have lots of options for controlling the operation (for example the mysqldbexport can produce one of several formats with object definitions, data, or both). The parameter includes the user name followed by the user’s password (if available) separated by a colon (colon is omitted if no password) followed by the @ symbol and the host machine name. Optionally, you can provide the port number and the socket file each preceded by a colon. That sounds like a lot of crazy typing but it is really simple. The following are some examples using this format. The following list describes the utilities available as well as some examples of use. For more details, please see the manuals for each utility. 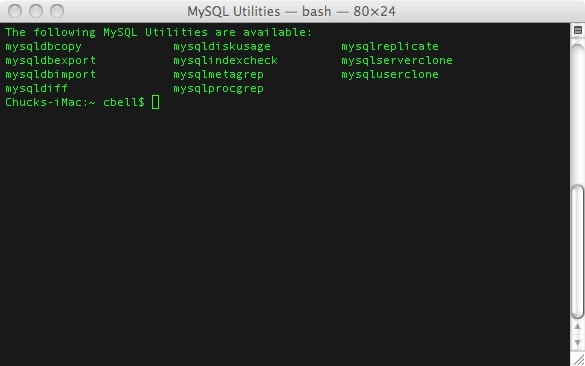 mysqldbcopy - Permits a database administrator to copy a database from one server either to another server as the same name or a different name or to the same server as the same or as a different name. Example 1: Copy a database named ‘util_test’ to a new name ‘util_test_copy’ on the same server. Example 2: Copy a database named ‘util_test’ to another server. mysqldbexport - Permits a database administrator to export the metadata (object definitions, hence definitions) or data or both from one or more databases. By default, the utility will export only definitions. Example 1: Export the definitions of the database ‘dev’ from a MySQL server on localhost via port 3306 producing CREATE statements. Example 2: Export the data of the database ‘util_test’ producing bulk insert statements. mysqldbimport - Permits a database administrator to import the metadata (objects) or data for one or more databases from one or more files in either SQL or a text format such as CSV, TAB, GRID, or VERTICAL. Example 1: Import the metadata of the database ‘util_test’ to server1 on port 3306 using a file in CSV format. Example 2: Import both the data and definitions of the database ‘util_test’ to server1 on port 3306 producing bulk insert statements from a file that contains SQL statements. mysqldiff - Reads the definitions of objects and compares them using a diff-like method to determine if two objects are the same based on the definition of the object. Example 1: Find the differences among objects in database employees on one server and emp1 on the same server. Example 2: Find differences between the salaries table on one server and the same table on another server. mysqldiskusage - Permits a database administrator to see the disk space usage for one or more databases in either CSV, TAB, GRID, or VERTICAL text formats. The utility will also allow the user to examine the disk usage for the binary logs, slow, error, and general log; and InnoDB tablespace usage. Example 1: Show only the disk space usage for the employees and test databases in grid format. Example 2: Show all disk usage for the server in CSV format. mysqlindexcheck - Eeads the indexes for one or more tables and identifies duplicate and potentially redundant indexes. Example 1: Scan all of the tables in the employees database to see the possible redundant and duplicate indexes as well as the DROP statements for the indexes. Example 2: Scan all of the tables in the employees database and display the indexes. Display the output in a tabular format. mysqlmetagrep - Searches for objects matching a given pattern and shows a table of the objects that match the pattern `’t\_’. Example 2: Find all objects that contain ‘t2’ in the name or the body (for routines, triggers, and events). mysqlprocgrep - Scans the process lists for processes that match the search criteria specified and will either print the result (the default) or execute certain actions on it. Example 1: Kill all connections created by user “mats” that are younger than 1 minute. Example 2: Kill all connections with queries that have been idle for more than 1 hour. mysqlreplicate - Permits an administrator to start replication among two servers. The user provides login information to the slave and provides connection information for connecting to the master. Example 1: Setup replication between a MySQL instance on two different hosts using the default settings. Example 2: Ensure the replication between the master and slave is successful if and only if the InnoDB storage engines are the same and both servers have the same storage engines with the same default specified. mysqlserverclone - Permits an administrator to start a new instance of a running server. Example 1: Create a new instance of a running server. Example 2: Create a new instance of a running server set the root password and turn binary logging on. 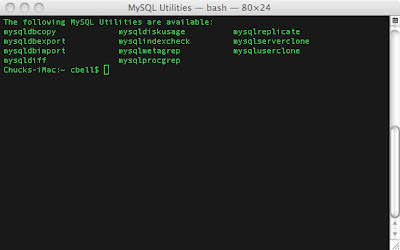 mysqluserclone - Permits a database administrator to use an existing user account on one server as a template and clone a MySQL user such that one or more new user accounts are created on another (or the same) server with the same privileges as the original user. Example 1: Clone ‘joe’ as ‘sam’ and ‘sally’ with passwords and logging in as root on the local machine. Example 2: Show all of the users on the localhost server in the most verbose output in CSV format. mut - Designed to execute predefined tests to test the MySQL Utilities. Example 1: Run all tests. Example 2: Run all tests that start with ‘clone_user’ and set the width of the display to 70 characters.